A few weeks ago, I wrote about the potential impacts Ukraine could have on Arctic gas development. Last week, I attended a conference in Singapore that covered Asia’s impact on the Arctic. Discussants also veered into European territory, with Crimea on many people’s minds. After all, Russia is the biggest player in the Arctic, and, as the FOCUS 2013 report from the Norwegian Intelligence Service asserts, “Russia remains the most important single actor in the Arctic region.” Moreover, the report states that the chief objective of Russia’s Arctic policy is to “safeguard access to energy resources and secure as much control and influence as possible.” Russia’s policies in the Arctic reflect its broader practices in what it considers its “Near abroad,” the areas that became independent countries following the breakup of the USSR. Ukraine is one of those areas. Leiv Lunde, Director of Norway’s Fridtjof Nansen Institute, posited that one of the most important effects of Crimea on the global energy market will be heightened interest in liquefied natural gas (LNG). Already, LNG trade has been on an upswing since the early 2000s. On top of increasing demand, the swiftly deterioriating relations between Russia and Ukraine highlight the vulnerabilities of pipelines, which are anchored in place often to politically unstable ground. While oil is normally transported by ship, rail, and road, making it easier to reroute transportation if areas in between become riven by conflict, natural gas still has to travel through infrastructure that is fixed in place, namely pipelines. This is where LNG offers an attractive alternative to the fixed infrastructures of conventional natural gas. LNG is mobile by its very nature. It can travel from the site of production to the site of consumption without needing to transit geopolitically tense terrain in between. Of course, where pipelines can be turned off or smashed by protestors (as happened in Egypt’s Sinai Peninsula in January), LNG carriers can be hijacked or attacked. However, this is probably unlikely to happen along the Northern Sea Route, for instances. Arctic resources like the Yamal Peninsula or Alaska’s North Slope therefore promise to be a source of more reliable resources that can be transited without political dangers in between export and import terminals (although, of course, the dangers of ice and stormy seas remain). Economically, however, transporting natural gas via pipelines is usually cheaper than LNG carriers across relatively short distances. This is one reason why instead of just building LNG terminals, Russia and Germany supported the construction of the Nord Stream pipeline connecting their two countries. As an LNG carrier would do, this pipeline avoids crossing the countries in or near Russia’s “near abroad”: Estonia, Latvia, Lithuania, and Poland. Nord Stream’s route reveals a deliberate attempt to avoid potential geopolitical hotspots on land by instead going under the Baltic and North Seas. The European Union’s previous interest in the now-cancelled Nabucco Pipeline, which would have run from supplies in Central Asia and the Middle East under the Caspian Sea, therefore avoiding Russia and the gas chokepoint of Ukraine, shows yet another attempt to avoid areas seen as risky for reliable energy transport. Thus, even more so after Crimea, LNG is an even more attractive option. Not just LNG from Arctic Russia, which may have shot itself in the foot with this incident by showing it to be a possibly unreliable energy provider, but LNG from all over the world – especially places like North America and Australia, which are expanding production. Currently, the U.S. can (subject to approval from the Department of Energy) generally export natural gas to countries with which it has free trade agreements, of which there are 20 (map), including, in Asia, Korea and Singapore. It is even more difficult to receive government approval to ship to countries with which the U.S. does not have FTAs, which includes all of Europe. It’s important to keep in mind that these are all developments for the long term. Europe obtains 80 percent of its gas via pipeline; only 20% come in via LNG. Asia is a different story though. In Japan and Korea, all supplies come in via LNG carriers. Without any pipelines to the mainland Eurasian continent, these are the two countries that stand most to benefit from Arctic LNG development. China, too, is looking to import more LNG and is constructing additional import terminals. Yet the country is equally looking to Central Asia as a provider via pipelines. So aside from showing the importance of LNG, Crimea also underscores that, as Europe is already trying to do, it should strive to diversify sources of gas – whether that means looking west across the Atlantic to North America or north to the Arctic. (Some mention has been made of Norway being able to step in to fill any supplies Russia might cut off, but it can only do so much, as this Reuters article explains.) Western Europe could take a page out of Japan’s book, where no country supplies more than 20 percent of its LNG imports (source). The Economist reported that Japan’s dependence on Russia for natural gas and oil partly caused its initial wariness to hit Russia with sanctions (it has since done so). Yet as the Economist itself notes, Russia only supplies Japan with 10% of its natural gas (all from Sakhalin) and 5 percent of its oil. This diversity in energy partners therefore gives Japan more flexibility in its political actions – something Europe surely envies right about now. The crisis in Crimea has also already motivated some in the U.S. Congress to push for speeding up the country’s moves to export its natural gas, which is in free flow thanks to the fracking boom. The U.S. recently passed Russia to become the world’s largest natural gas producer. Crimea could also encourage those in Alaska to try to restart exports of their state’s natural gas particularly to Asia, which pays the highest price on average in the world for the resource. Unlike oil, the market for natural gas is regional rather than global. 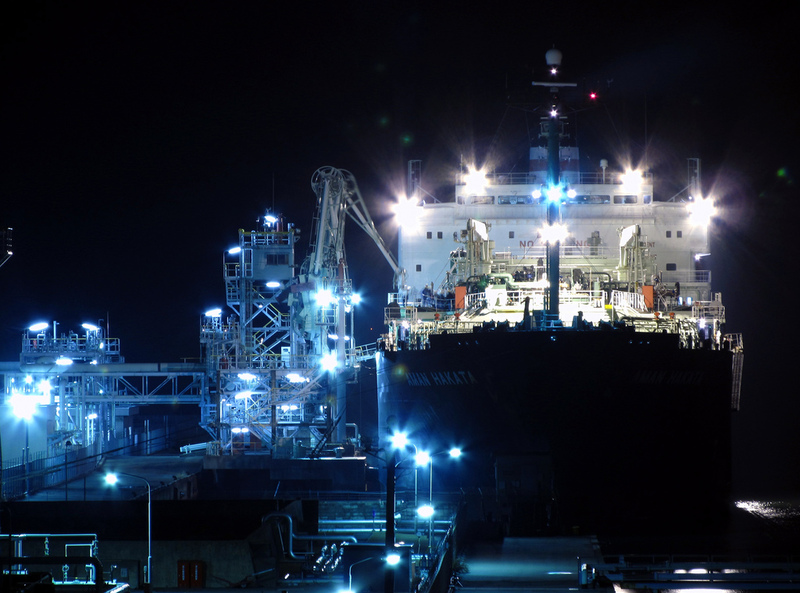 Alaska exported LNG to Japan from the Nikiski plant on the Kenai Peninsula for several decades. ConocoPhillips, whose export license expired in 2013, requested this past January to restart exports to countries without FTAs with the U.S. – even before the crisis in Crimea took place. (As an aside, it’s all the more ironic that the Kenai Peninsula was home to some of the earliest Russian settlements in Russian America.) Now, Crimea only adds fuel to the fire to begin getting Arctic – and North American – gas in liquefied form and out onto the global market.